Property 2: Afroditi Villa, goddess Of Beauty And Pleasure In Cretan Nature! Property 5: Estia, "goddess" Of Family And Warmth In Cretan Nature! Relax and Enjoy the Cretan nature at Villa Estia! Property 6: Relax and Enjoy the Cretan nature at Villa Estia! Property 8: POOL HOUSE WITH FANTASTIC VIEW OVER THE SEA AND THE MOUNTAINS WITH ROOFTERRACE. Liakada Cottage, amazing sunsets & sea views! 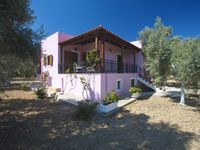 Property 10: Liakada Cottage, amazing sunsets & sea views! Experience the authentic Cretan spirit at Villa Afroditi! Property 13: Experience the authentic Cretan spirit at Villa Afroditi! When beauty meets natural simplicity in a Cretan field! Property 14: When beauty meets natural simplicity in a Cretan field! Property 15: Athina, "goddess" of wisdom and inspiration! Property 20: Experience the authentic Cretan spirit at Villa Afroditi! Cottage to meet Village life 2km from the beach! Property 22: Cottage to meet Village life 2km from the beach! Property 27: HELIOS. Hidden paradise. Really nice house with such friendly people!! Wir verbrachten eine Woche in diesem wundersch&ouml;nen Haus mit einem herrlichen Garten. Die Orangen und Zitronen konnte man vom Fenster aus abpfl&uuml;cken! Die Vermieter sind sehr sehr nett, jeden Tag gab es eine kleine k&ouml;stliche &Uuml;berraschung aus der super leckeren K&uuml;che der Mutter! Die Lage des Hauses in einer ruhigen Gegend in einem gem&uuml;tlichen Dorf etwas abseits von den Touristenhochburgen war perfekt und auch unsere Jungs konnten sehr sch&ouml;n in dem herrlichenGarten mit Pool spielen. Relaxing rest and hospitable owners! We easily found the location , the family was waiting for us. Elia's mum had prepared for us homemade food and we were offered fruits and sweets. We were reallt pleased by the garden. It is full of trees and flowers, spacious and well-cared by the family's dad. The village is indeed very quiet (very few cars pass by) and we really enjoyed our drink in the evening sitting outside by the pool. Our holidays were exceptional there and the owners were great too! Strongly recommended ! !